The National U.S.-Arab Chamber of Commerce (NUSACC) held its fourth annual High Tech Road Show (HTRS) this past January as their kickoff event for the new year. The High Tech Road Show included three days at the International Consumer Electronics Show (CES) in Las Vegas, Nevada and an executive tour to Silicon Valley in California. Delegates from throughout the Arab world -- including, Qatar, Tunisia, Jordan, Libya, Lebanon and Syria -- met with leading U.S. information and communication technology (ICT) companies with a view to promoting cutting-edge technology transfer and building capacity in ICT and human resources in the Arab world. The High Tech Road Show, organized by NUSACC, offers an executive platform of networking, matchmaking, and briefing opportunities in the United States for ICT professionals from throughout the Middle East and North Africa region. 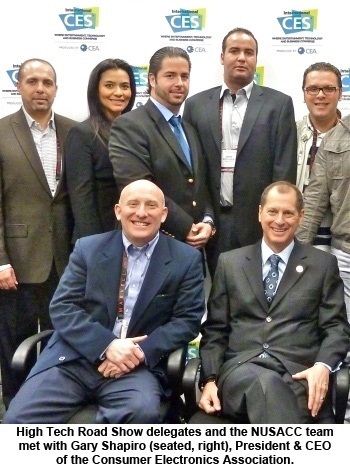 Gary Shapiro, President & CEO of the Consumer Electronics Association (CEA), the largest U.S. trade association for consumer electronics that represents more than 2,000 consumer electronics companies and the organizer of CES, noted, "International CES, as an international event, highly values the High Tech Road Show 2011 delegation visiting from the Arab world given the region’s growing importance in the world economy." IBM’s Terry Hansen, who hosted the HTRS delegation, expressed congratulations to NUSACC on its High Tech Road Show, also stating, "IBM was delighted to host the NUSACC executive delegation from the Middle East and North Africa for an executive briefing in our Silicon Valley offices and to introduce them to our future plans and the many promising opportunities that IBM looks forward to work on with partners in the MENA region." ​Attendance at the 2011 International CES surpassed all expectations. More than 140,000 trade professionals participated in this year’s CES, and more than 2,700 technology companies across global industries dazzled attendees at the show, with the ground-breaking event energizing the technology world. The 2011 CES set several new records, including 30,000 international attendees and 22 top CEOs participating in keynotes. Meetings during the High Tech Road Show provided an opportunity to showcase some of the NUSACC’s top member companies. In Silicon Valley, high-level sessions were held with such entities as Cisco, Intel, HP, IBM, Google, and Stanford University, and an entrepreneurship and innovation event and reception was held in Palo Alto, CA with members of TechWadi – the leading voice for the U.S. Arab technology industry, with 1,500 member companies. These sessions followed on the heels of high-level meetings at the International CES with such companies as Hewlett-Packard, IBM, Microsoft, Google, Yahoo and Intel. ​Fawaz Bilbeisi of the Embassy of the Hashemite Kingdom of Jordan noted, "NUSACC puts more than 40 years of experience and a strong network with the U.S. private sector at the disposal of Arab Companies. In particular, the High Tech Road Show presents the Arab ICT sector with an important platform to connect with major players in Silicon Valley to make a valuable pitch." 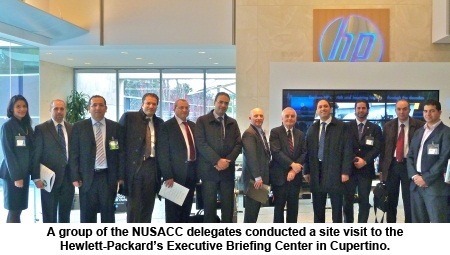 Talal Al-Mughaiseeb, a delegate from the Qatar Olympic Committee, said, "I had the pleasure to participate in NUSACC's 2011 High Tech Road Show that included visiting the Consumer Electronics Show and major U.S. companies in Silicon Valley. CES was a tremendous opportunity to witness where 21st Century technology has reached. It is a green land for all companies and organizations in order to keep up with the latest trends by exploring new partnerships and business networks. Silicon Valley is a dream city for all investors in technology because it is home to world-renown companies. 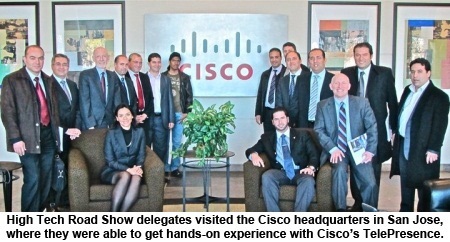 It was person ally exciting to meet with Cisco's staff because of their fantastic work in the sports industry. Stanford University was another great stop. Overall, I am very satisfied with the tour, and we look forward to participate next year and explore more technologies with a focus on sports-related companies." ​Samir Ben Taieb, Managing Director of SamsTech in Tunisia, said "This is my second year attending the High Tech Road Show with NUSACC, and it just keeps getting better every year, with outstanding network opportunities and very resourceful briefings with the biggest ICT companies in the world. In addition to meeting with hundreds of U.S. ICT companies at CES and Silicon Valley, the Road Show granted me a unique opportunity to meet with many companies from neighboring countries in the Middle East and North Africa attending the Road Show with NUSACC." NUSACC’s partnership with CEA and solid relationships with leading ICT companies such as IBM, Cisco, Intel, Google, HP, Yahoo, Oracle, and Microsoft grants the Chamber the privilege to open all doors to its visiting delegates representing major ICT companies in the Middle East and North Africa, access labs, attend executive briefings by chief strategists, and participate in networking opportunities with hundreds of ICT companies from the United States. Concluded Amin Salam, NUSACC’s Director of Business Development and organizer of the Road Show, "ICT is an increasingly rapid sector for innovation and job creation, and we are delighted that interest from the Arab world keeps getting stronger every year. 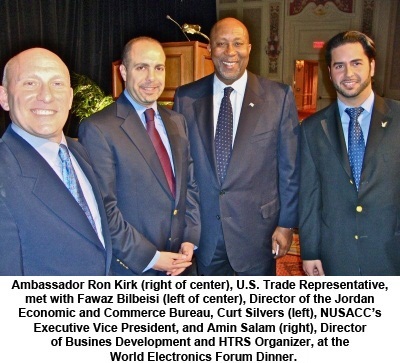 The High Tech Road Show to the United States is a signature one-of-a-kind event for Arab ICT leaders interested in consumer electronics and new technologies of the future, and our Chamber was pleased to organize such a remarkable event. Plans are already underway for the 2012 High Tech Road Show which promises to be even bigger and better."